Cryotherapy has long been an integral part of the popular RICE technique for sports recovery. Hilotherapy is the optimal form of Cryotherapy, allowing precise temperature control and consistent targeted delivery to the site of treatment. “We are using Hilotherapy already for some time. We apply it pre- and post-operatively prevalent with ligament injuries, bruises, knee injuries etc. With Hilotherapy we see a considerable reduction of pain as well a considerable reduction of swelling and hematoma. "I have been using Hilotherapy for the last three years and it has become an integral part of my Physiotherapy service at Northants Cricket. It is fantastic to have a piece of equipment what gives me the opportunity to optimise tissue homeostasis pre-operative, immediately post-surgery in the cast, sub-acute and a chronic phase of injury management during a long and physically demanding County Cricket season. 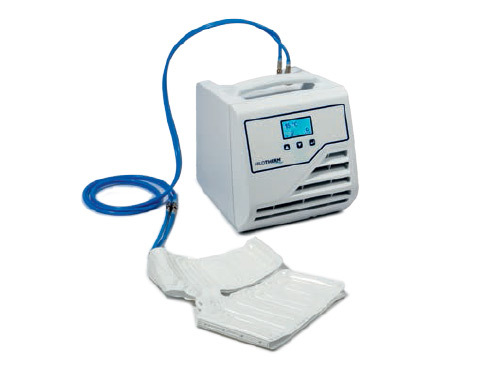 This is made possible due to a unique blend of anatomically shaped thin cuffs for all parts of the body where a controlled cooling and warming effect between 10-38°C can be established. To have a clinical Hilotherapy unit in the Physiotherapy Department at the County Ground and a hand held unit for the away fixtures, pre-season tours or home visits offers me the opportunity to use Hiloterm everywhere and any time. It is great to see Hilotherm’s ongoing commitment to collect clinical data for research to develop faster and better ways of reducing recovery times of injury and post-surgery rehab." "The Hilotherm device has already helped me many times to cure minor injuries caused for instance by slashing or swiftly moving pucks. It enables faster healing which is very useful in the intensive NHL season. Yet another advantage is the size of the device. It is easy to transport and does not use much space." "I was thoroughly impressed with how comfortable and effective the treatment is for both new and old injuries – I knew I had to purchase one for myself as it would help me recuperate much faster. I'm looking forward to being fit and ready for future fights with the help of Hilotherapy." "Team GB Boxing used Hilotherapy in both the lead up to and during the London 2012 Olympic Games. The treatment was primarily used for helping our boxers overcome specific injuries they had sustained previously. The feedback from the athletes that used the treatment was very positive including our first ever women’s Olympic Gold Medallist Nicola Adams who used the treatment for her hand and our first ever women’s World Champion Savannah Marshall who used the treatment on her lower leg. The medical team responsible for using this treatment with our boxers would be more than happy to recommend its use to others." "At home I sit with the Hilotherapy cuff strapped to my knee. Ice packs can burn a bit but Hilotherapy is really comfortable. It really helped me recover for Strictly come Dancing and I was able to tango again." "On April 15th 2014, I ruptured my Achilles tendon competing in a T20 match for Northamptonshire County Cricket Club in Barbados. I was rushed home and underwent immediate surgery to repair the damage. The club Physiotherapist, Barry Goudriaan and Tony Ley from Hilotherapy decided that the best option for my recovery was to install a Hilotherm ankle cuff underneath my cast so that I could have continuous cooling to my Achilles. The cuff was fitted relatively easily and I was immediately plugged into the machine with the temperature set to 12ºC. After being discharged the following day, I set up my camp for the next 2 weeks in my living room (see picture). I had the Hilotherm on 24/7 for the initial few days and I cannot tell you how thank full I am that I had it. The initial pain after the operation was excruciating but as soon as the machine was turned on, I instantly had relief. This continued to the extent that after 5 days I stopped taking any of my prescribed pain killers and just used the Hilotherm as my pain relief. It really did work that well! The initial stages for me were all about controlling the pain and the Hilotherm certainly did that. Anyone who has been in a cast will know that it gets very hot and sweaty underneath! I was lucky that the Hilotherm Machine negated any of this for me and I had complete control of the temperature making my time on the sofa far more comfortable. The next stage of my recovery was to begin Physiotherapy when the cast came off after two weeks. Initially my ankle and calf began to swell up significantly after any treatments. This period was when I really needed the Hilotherpy to reduce swelling and tissue damage. Immediately after a session I would put the ankle cuff on but also wrap a cuff around my calf as well so I had control of the whole area. The effects were incredible and after about an hour of a constant, slightly warmer temperature, the swelling had nearly disappeared and enabled me to regain some of the movement back in my ankle. I am now nearly 2 months post operation and my progress has been very positive. 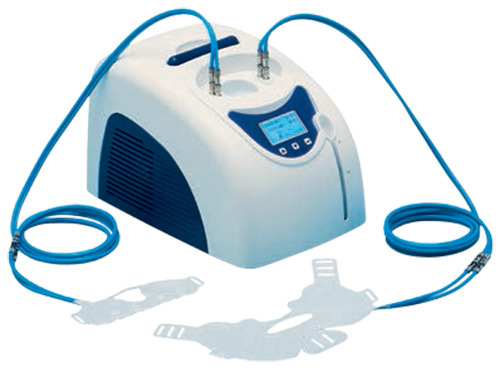 I am using the Hilotherm machine twice daily and after every rehab session that I undergo. I would recommend the technology to absolutely anybody, not only in sport but anybody that has an injury where they want to have more control over the rehabilitation process. I still have a long way to go in my recovery but I have absolutely no doubt that I would not have progressed as quickly as I have without the use of my Hilotherm machine. I will continue to use the machine until I get back to full fitness. Thank you to Tony and everyone at the company for all the support!"